Peanut butter Oreos, I mean really. They took the most iconic chocolate cookie and put peanut butter in the filling. It HAS to be good. Cream cheese just makes everything better. A little bit of pretzel cause chocolate and pretzels are meant to go together. Sprinkles because they make everything special. Daycare is closed this week, so I get to be home with the little guy. My youngest sister, Chloe, is home from college this week for Thanksgiving break. So MiMi and Chloe came over to make some festive treats with us. They are bringing this to the Thanksgiving feast at grandma's. The rest of the treats are more winter themed and I will start sharing them soon! MiMi thought it would be a good idea to freeze the balls with the pretzels in the acorns already. This made dipping really easy because there was a built in handle. It did make adding the sprinkles a bit of a challenge, but in the end I think it was worth it! They turned out really cute and I think everyone will love them. How could they not? In a food processor, process the Oreos into crumbs. Add the cream cheese and process until well mixed. Form the cream cheese mixture into small balls (about a Tablespoon each). Flatten one side a bit and pinch the other side to create an acorn shape. 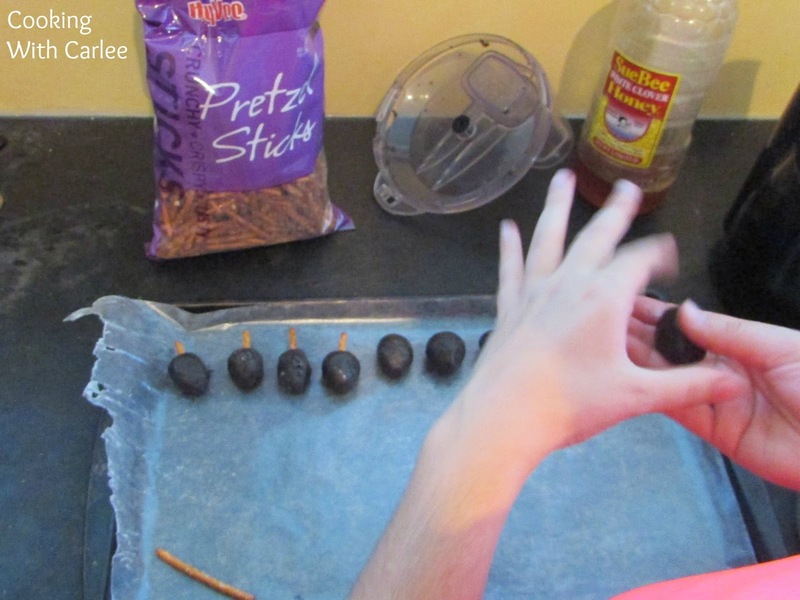 Place 1/2 of a pretzel stick into the flatter side of the acorn and place onto a baking sheet lined with wax paper. Freeze acorns for about an hour. 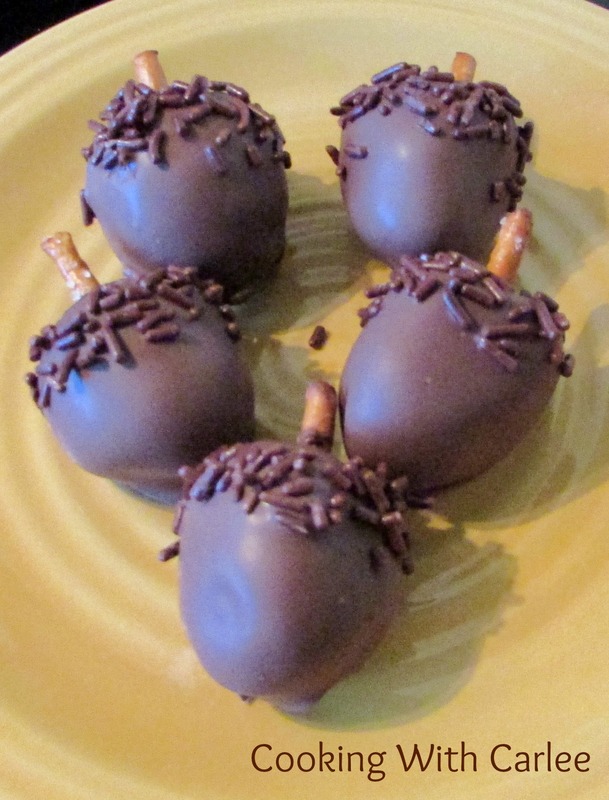 Just take a few acorns out of the freezer at a time because they are much easier to dip when they are frozen solid. Holding the pretzel stick, dip the ball in the chocolate until covered. 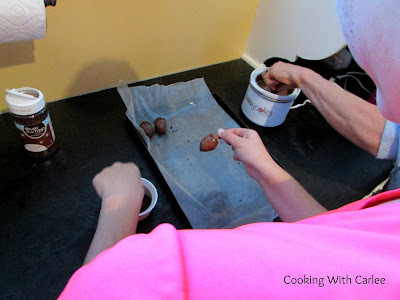 Add sprinkled to the top of the acorns and place on waxed paper to harden. Try your best not to eat them all! They were both for sure! Thanks so much, Katie! I hope you had a wonderful Thanksgiving! Cute cute idea! Thanks much for sharing with us at Weekend Potluck. I love these kinds of treats! Thank you so much. My mom and sister were definitely the instigators on these, but I was more than happy to go along with it! Thanks for hosting! Carlee, these look like something that would be very popular! Peanut butter, chocolate, cream cheese--can't go wrong there! They definitely were a hit with our family! Wow Carlee those acorns sure look cute and I bet are delicious! 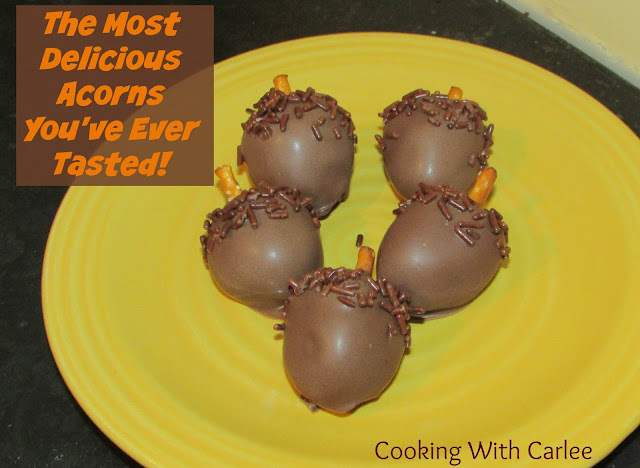 They were delicious and so much fun to make! Thanks for hosting, Julie! Carlee, you're so naughty :) They look scrumptious and I just know one will not be enough. Thanks so much for your contributions to Fridays Blog Booster Party. I am looking forward to seeing you at the Blogger's Pit Stop rally on Friday with more of your posts. I have been extra naughty lately too! I need to be nice for a few weeks so I can be naughty again for Christmas! ;-) Thanks as always for hosting and stopping by! These look so cute and sound even more delicious!